Electrical engineering is a historical reference to what is today known as electrical, electronics, and computer engineering. It is a broad profession that combines science and technology to design, create, and maintain products and services in diverse fields. Engineers in the fields of electrical and electronic engineering basically conduct research, design, test, and monitor development of electronic systems and production of equipment and devices used in different industries. They have a diverse range of areas of interest from advanced global positioning systems to development of domestic power appliances. They are responsible for designing and developing almost every gadget you see at home or in industrial settings, from communications and broadcast systems, electric motors, lighting, automobiles, navigation systems, machinery controls, and transmission devices to aircraft and radar systems, computers, and much more. Electrical and electronic engineering is a very diverse profession but for the purpose of our discussion, let’s narrow things down to the field of electronics. Electronics, more specifically, electronic design, has emerged as the cornerstone of almost every aspect of technology. It is a specialist field that supports all areas of science including technology, medicine, and other natural sciences. Professionals in this field deal with the release, collection, control, transportation, and energy conversion of electrons and other sub-atomic particles that contain mass and charge. Electronics is a fast-changing field due to the rapid advances being made in technology each day. 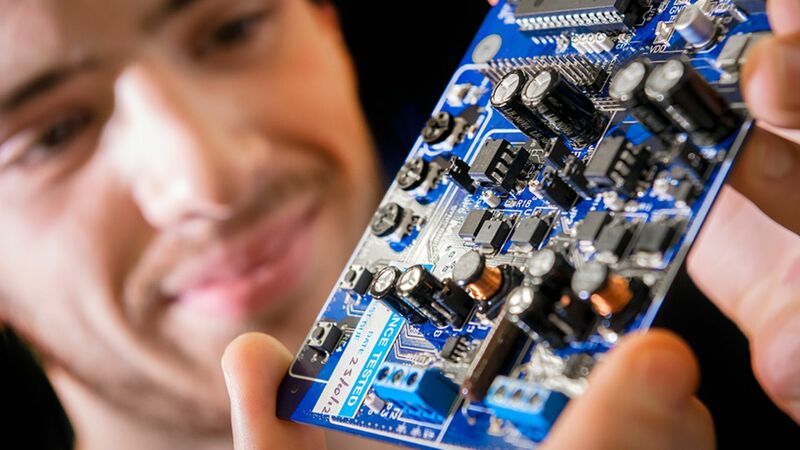 Electronics design focuses on the development of devices, systems, and equipment that use sub-atomic particles such as computers, sensors and transducers, integrated circuits, telecommunication equipment, audio and video devices, process control systems, prosthetic devices, detection systems, and much more. It is an interesting field with diverse areas of specialization. They design different types of electronic devices, products, software programs, and other systems used in commercial, medical, industrial, military, and scientific research applications. Collect and analyze consumer needs to determine the actual requirements, capacity, and overall cost of developing electrical systems and devices. Develop procedures for testing and maintenance of electronic equipment and components. Evaluate electronic systems and provide recommendations for improvement, modification, and repair of equipment. Do a regular inspection of electronic equipment, tools, instruments, and systems to ensure that they meet the required safety standards and regulations. Develop applications and other necessary modifications for electric equipment and systems to improve performance. Engineers in this field who work for the government undertake research, development, and evaluation of devices used in diverse areas such as computing, aviation, manufacturing, and transportation. They handle federal equipment and systems including radar and sonar systems, satellites, flight control systems, and communication equipment. Electrical engineers and electronic engineers often do similar work. They use design software and equipment to handle similar tasks. Their work is also closely related to the tasks handled by computer hardware engineers. So, how does one become an electronics engineer? To become an electrical or electronics engineer, you’ll need to first have a bachelor’s degree. A bachelor’s degree prepares you for an entry-level job in this area of engineering specialty. Courses offered in this field include differential equations, digital systems design, and electrical circuit design theory just to mention a few. Some colleges even provide cooperative programs which combine classroom time as well as practical work to equip students with hands-on skills in the industry. There are even five-year study programs in engineering that lead to bachelor’s and master’s degrees after completion. Though it isn’t required, it is advised by may for anyone aspiring to become an engineer to start specializing and studying for this career while still in high school. Students aspiring to become electrical engineers need to have a strong science and mathematics background. They need to take many math and science subjects and specializations including trigonometry, algebra, and calculus among others. They should also take courses in drafting as they will be required to have a working knowledge in technical drawing in their career. A bachelor’s degree in this field takes four years and includes classroom, laboratory, and field work courses. To qualify for positions in research, electronic engineers must have a master’s degree or other relevant certifications. They’ll also be required to pass the Fundamentals Engineering and the Principles and Practice of Engineering examinations to become licensed engineers. A high level of concentration to keep track of numerous design elements and technical demands of the profession. Have the initiative to apply their knowledge in new projects and tasks. Have the desire to keep up with emerging trends and technologies in the industry through continuing education. Have good interpersonal skills in order to work well with other professionals in the manufacturing process. Have good speaking skills to explain their design concepts to stakeholders of any project they undertake. They should be able to explain complex issues to clients who have limited or zero technical knowledge. The first examination, Fundamentals of Engineering (FE), is usually taken immediately after completion of the university course. Those who pass this exam are known as Engineer Interns (EIs) or Engineers in Training (EITs). After gathering some work experience, the EITs usually take a second exam known as the Principles and Practice of Engineering examination. In some states, engineers are required to undertake continuing education courses to maintain their license. There are ten major industry sectors that employ a majority of electrical and electronic engineers as well as computer scientists. Local area networks such as radio and connected sections in buildings and university campuses. Fiber optic trunks as well as satellite and microwave connections for intercity traffic. Power electronics specialists in this field design systems, equipment, and tools used power generation, distribution, and maintenance of power control systems. Computers serve almost every industry today including transportation, telecommunications, medicine, aerospace, automated manufacturing, and construction among many others. The computer industry is a strong rapidly growing sector partly because of corporate America’s desire to reduce dependence on centralized mainframe systems in preference for flexible client/server networks or private networks based on the Internet. There is a growing demand for electronic engineers and designers in this sector. The semiconductor technology is the driving force behind the booming computer industry, especially in the development and manufacture of integrated circuits. According to frequently published articles in the world of semiconductor news, this is an area with a rapidly growing demand for electronic engineers with jobs ranging from advanced semiconductor physicists to manufacturing engineers. As technology evolves, there’s always a need to create new semiconductor devices to service a variety of electronic products. Electronic engineers in this field normally design and develop electronic and power electronics used in aircraft, spacecraft, and helicopters. There is a wide array of electronic devices and equipment used in this field including controls, displays, communication, and navigation gadgets. Also known as biomedical engineering this is a wide field that combines different aspects of engineering and the biological or medical field to design and develop biological research, diagnostic, and therapeutic devices with the help of electronic engineers. This is probably the largest industry that employs different types of electronic engineers. Manufacturing technology has in recent years become an integral part of every country’s economy. Companies are now reevaluating their manufacturing technologies in pursuit of increasing productivity, remaining competitive, and adopting better process controls. The emphasis on cost-effective and environmentally friendly manufacturing technologies has led to a booming demand for electronic professionals in the manufacturing industry. The service industry has become a major employer for electronic designers and engineers. This is primarily because these companies have become more reliant on technical issues such as data management techniques and equipment to provide better services to their clients. A good number of electronic engineers venture into the world of education and research to further enhance the existing body of knowledge in their respective fields of specialization. Some complete their Ph.D. degrees and become university lecturers. There are others who venture into corporate universities and institutions run by companies such as Intel, Motorola, and Bellcore among others. There are some electronic engineers who become consultants in their respective areas of specialization. The ever-evolving transportation and automotive industry has also emerged as one of the largest employers of electronic engineers. Transportation, in this case, includes shipbuilding, railroads, trains, and traffic management. These are areas that rely heavily on electronics and other engineering disciplines to design and develop communications, navigation, and display gadgets. The auto industry has always been desperate for electronic professional to develop fault-tolerant and high-performance electronic devices. Finally, it is important to mention that as an engineer in this field, professional organizations and associations play a major role in keeping you informed of emerging trends in the industry. These type of associations usually promote the interests of their members besides providing you with a network of contacts that you can rely on to find better-paying jobs and advancing your career. The IEEE is one of the leading organizations for electrical and electronic engineers. The organization is divided into 10 geographical locations and usually organizes over 300 major conferences every year. It plays a major role in establishing and overseeing many wireless standards and wireless protocols used in many industries that deal with electrical and electronic devices. Together with the great sense of satisfaction you get for being an electronics engineer, you deserve to be well compensated for the job you do. What you earn in this field depends on many factors such as your education level, the function you serve in the organization, your occupation, and where you live and work from. The United States Department of Labor’s Bureau of Labor Statistics put the median income for electrical engineers and electronic engineering professionals at $75,930. The starting salary for an engineer with a Bachelor’s degree is around $55,292 while one holding a Master’s degree starts at $66,309. Engineers with a Ph.D. degree have an average starting salary of $75,982. Full time employed engineers in this field also benefit from bonuses and commissions that add the value of their base pay significantly. As per the U.S Bureau of Labor Statistics, both electrical and electronic engineers currently hold around 291,000 jobs in the United States. This is actually 19.4% of all engineering jobs in the U.S. Just about every industry in the U.S has a need for an electrical or electronic engineer. The Bureau of Labor Statistics states that this field of engineering is expected to have a 6% employment growth in the 2006 to 2016 decade. The growth is spurred by a high demand for electrical and electronic devices in virtually every industry as the world becomes more technological. The field of electrical engineering is a rewarding, fascinating profession to pursue. Those that rise to the challenge and fill these highly sought after roles will need to make a solid commitment to life-long learning. The electronics industry is ever-evolving, and there is a need to stay on the leading-edge of new technological advancements to be truly successful in this profession, with jobs ranging from advanced semiconductor physicists to manufacturing engineers.